Benedict Cumberbatch (BC) is a magnificent actor—hardly a newsflash to anyone who has seen BBC’s series Sherlock. He’s been nominated for more than one Emmy and I’m sure an equal amount of awards in Britain. I enjoyed the first Star Trek, but I admit I was even more excited for the sequel when I heard BC was cast as the movie’s villain. I saw Into Darkness opening night and was not disappointed by BC’s performance. He was so compelling that there were times I was secretly rooting for him, and I’m a fan of Pine’s Kirk and Quinto’s Spock. As the weeks passed, I wondered why I found BC’s villain so gripping. Last week a friend who had been overseas when Star Trek was released returned home. She was searching for someone to go see it with her. I quickly volunteered to see it again, driven by my desire to study BC’s character. Since I knew how the story turned out, I was more detached this time. From the first scene with BC, I scrutinized his movements, speech, and facial expressions. Was it just because I had grown fond of his Sherlock character? I didn’t think so, as his Star Trek character was markedly different. 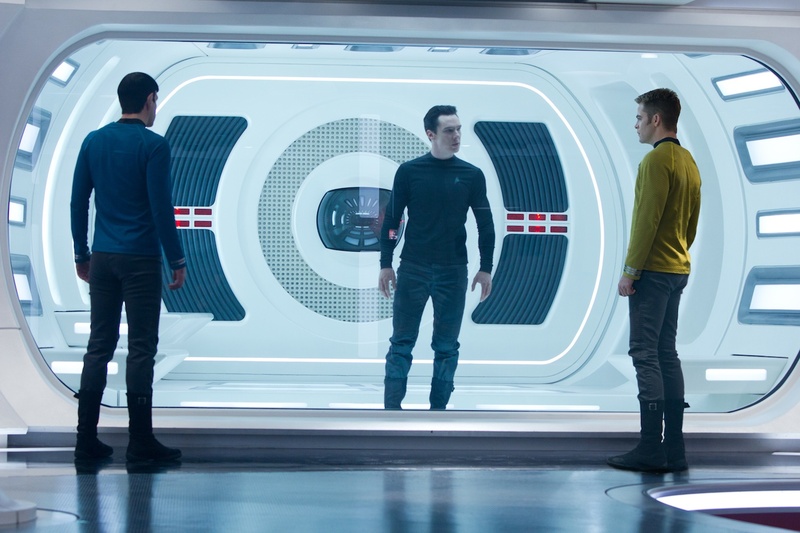 As BC paced in his containment cell, lecturing Kirk, I realized even more than his costume, facial expressions, or movements, Cumberbatch’s character was conveyed with his speech. While I’m certain some of the credit here belongs to the screenwriter(s), BC’s delivery was critically important. Thinking back to episodes of Sherlock, which are written by a different person, I remembered that BC does the same thing with Sherlock, although in a way appropriate to that character. I’m not talking about his British accent here. I’m talking about how he lorded over Kirk without touching him. He did this with his word choice, intelligent reasoning, short clipped commands followed by longer explanations spoken with a condescension that belittled Kirk. BC barely moved his hands or body throughout this, and his face was nearly frozen as well. His diction and cadence alone expressed that he was a dangerous man of great intelligence and brutality. I have read a number of writing guides that state your characters should each have a distinct way of talking, so that even if you took away the speaker attributions, you should know which character is speaking. I had a hard time understanding this advice. How was that accomplished exactly? As I watched BC on the screen, I understood. So how do you make your characters spring to life as if Benedict Cumberbatch had lent his magic to enliven their dialogue? On Monday, I’ll walk through some examples of how to make each of your characters’ dialogue distinct.